The World Health Organization has identified India as one of the 57 countries that suffer from critical shortage of Health workers (World Health Report 2006). This fact may make some think- in such scarcity doctors must be having some lucrative jobs waiting for them in order to lure young brains for medical profession. But the reality is far from this. A doctor has to go through years of rigorous training ranging from 10 to 12 years to become postgraduate. A postgraduate doctor then applies for senior residency at the age of 28 to 30 years. Reasonably, it is an age where one expects some social/financial security in his/her life. At this age, every individual is expected to support their family and start making some future plans. In a life of a doctor however, practically, this is nowhere to be seen. A doctor has to travel across the country to find jobs, even ones with no security and visible future. Is it justifiable? And what does the government have to offer to us class one officers? Nothing but a culture of adhocism of 30 to 89 days. It seems that biggest employer of healthcare workers is also the one which is most exploitative, where our highly qualified colleagues have no job security, no definite place to settle, no proper schooling of children and they move like vagabond over and over every 30-89 days. When the tenure of senior residency is fixed why can’t we be offered a straight 3 years of service instead of harassing us again and again? What is the catch behind holding interviews again & again for 89 days? I fail to understand that, why a country like ours which is in such desperate need of healthcare providers is offering its trained doctors with only job insecurity? All this adhocism does is to make residents live a life of fear, that they may be terminated any day now, with just one week’s notice. A time where the society is expecting us doctors to do wonders and heal patients, we ourselves live our professional lives with a bruised self-respect and a sense of wonder of what will happen to our future. Government’s stance on the issue of adhocism ranges from ignorant to defensive. We listen back to the reasoning of contractual hiring to fill in spaces as the government only interviews for SR posts twice in a year. But, Why? Why can’t the government like the private sector advertise and hire for full three years every time there is a vacancy, and wait for the fixed time to lapse? Further, why can’t the government, if unable to find a suitable candidate in the interviews, offer a position to the already working ad-hoc SR? This adhocism prevalent in the medical system also raises a fundamental issue. Why is it there only in the health care sector? Why is it only for doctors? Let me ask the government why they never appoint other class I officers like IAS, IPS or Judges on ad hoc basis. Why the doctors are the only ones exploited and undergoing the humiliation of ad hoc culture? Not only this, if the terror of being terminated at the end of 30-89 days is not enough, the sorrow of lack of recognition is strong enough. Government does not even provide basic benefits to ad-hoc residents. One of our colleagues, a senior resident in Anaethesia department at a Delhi government hospital passed away due to swine flu which he contracted on the job, but alas, no medical benefits were extended to him by the government, even though he got the disease on duty. Is it too much to ask that doctors who work for the government, ad-hoc or permanent, should be given health benefits given the fact they are maximum at risk? We as FORDA have clearly been fighting with the government on this issue of adhocism. 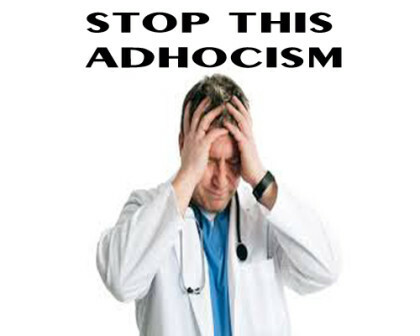 We demand that Ad-hocism be abolished at the earliest, and all doctors be treated alike, especially when it comes to health benefits from the government.